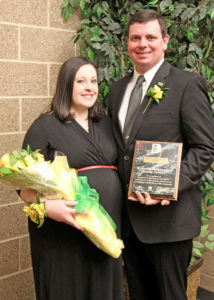 Brandon and Jessica Batten of Four Oaks were selected this month as the 2019 National Outstanding Young Farmers of the Year at the 63rd annual National Outstanding Young Farmers Awards Congress. The event was held Feb. 7th-10th in Bettendorf, Iowa. The winners were selected from a group of 10 finalists for the award based on their progress in an agricultural career, extent of soil and water conservation practices, and contributions to the well-being of the community, state, and nation. Guest Master of Ceremonies Orion Samuelson announced the winners and interviewed them for an upcoming episode of This Week in Agribusiness. There were three other national winners for 2019. They are from Iowa, Maryland, and Illinois. National winners received a savings bond from corporate sponsor John Deere and the opportunity to travel to Washington, D.C., during National Ag Week in 2020. Brandon Batten graduated from South Johnston High School in 2004 and attended NC State. He graduated with a master’s degree in ag engineering and also completed ag leadership development and farm management programs. Brandon has been farming his entire life but has been a full-time farmer since finishing college in 2010. In addition to farming, Brandon collaborates with the university extension service in trials to test new methods. His modernization of the drying systems in tobacco barns and his progressiveness in farming techniques earned him the state’s Innovative Young Farmer of the Year award in 2017. Working with his father and uncle at Triple B Farms near Strickland’s Crossroads, Brandon manages the daily operations and makes the budget and cropping decisions. The farm has expanded to include soybeans, wheat, corn, rye, hay, and cattle on 870 acres. Mechanical harvesting and leaf handling equipment is utilized in the tobacco operation along with GPS guidance on tractors. Brandon flies a drone to aid in crop scouting and began a custom drone service call Flying Farmer LLC. He also uses an Integrated Pest Management system. His wife, Jessica, who is originally from Fayetteville, is an environmental engineer. Her knowledge has helped the farm develop its conservation plans, including grassed waterways and infiltration strips to catch and sequester any nutrients from runoff. The couple has a son, Camden, and will welcome twins in March. Brandon is an ag advocate on social media and serves on the Strickland’s Crossroads Volunteer Fire Department, Board of Directors of the Johnston County Farm Bureau, Board of Directors of the Tobacco Farm Life Museum, FFA alumni, and Johnston County Extension Advisory Council. The Batten’s are also members of Pauline Baptist Church. 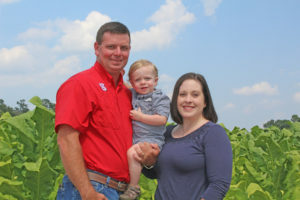 The Johnston County Farm Bureau will honor Brandon and Jessica during a special reception on Thursday, Feb. 28th from 6:00pm until 7:30pm at the Farm Bureau Auditorium on S. Brightleaf Boulevard in Smithfield. The public is invited to attend.